This Blueberry Coffee Cake has been in the family for thirty years! 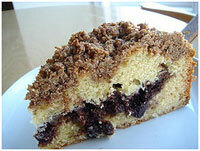 I'm going to let you in on one of our family's favorite recipes...blueberry coffee cake! You know those recipes that you instantly adopt as "worth repeating?" Well, this is one of those recipes. It's the cake that keeps on giving. Family breakfasts, brunches, neighborhood pot lucks, cake sales....you name it, you'll be making this cake! After you bake this recipe, let us know what you think or if you'd like one of your favorite recipes featured on our site, please drop us a line.! The cake in the picture was baked by Candy Wong from Toronto. You can find Candy at flickr.com Thanks, Candy! Now have some fun......happy baking! 2. Grease and flour a 9 inch Bundt pan. 3. In a large bowl, cream together the butter and sugar until light and fluffy. 4. Beat in the eggs one at a time, then stir in the sour cream and vanilla . 5. Combine the flour, baking powder, and salt; stir into the batter just until blended. 7. Spoon half of the batter into the prepared pan. 8. In a small bowl, stir together the brown sugar, cinnamon and pecans. Sprinkle half of this mixture over the batter in the pan. 9. Spoon the remaining batter over the top, and then sprinkle the remaining pecan mixture over the batter. 10. Bake for 55 to 60 minutes in the preheated oven, or until a knife inserted into the crown of the cake comes out clean. 11. Cool in the pan over a wire rack. Invert onto a serving plate, and tap firmly to remove from the pan. Dust with confectioners' sugar just before serving.